Everybody loves cake, even fast-food burger restaurants. (Well, okay, maybe not the actual restaurants, but the people behind the scenes do.) Read on to discover news about this 90th bday bash that occurred in Wichita, Kansas. Sadly, no news regarding the cake was provided. COLUMBUS, Ohio, May 23, 2011 /PRNewswire/ — On Thursday, May 19, White Castle executives and family members from the third and fourth generations made a pilgrimage to Wichita, the city where the fast-food chain was founded, in celebration of its 90th birthday year. Local grocery store Dillon Marketplace, also celebrating 90 years in business, hosted White Castle, Wichita Cravers and local officials for a day of Original Sliders® and fun. White Castle and Dillon each gave back to the Wichita community with contributions of $9,000 each to the Kansas Food Bank. Each $9,000 donation will provide nearly 24,000 meals to hungry families in need. Additional funds raised during the Dillon event went to the Wichita Fire Department and the Wichita Police Department. The pilgrimage also included a stop at the Sunflower Bank, which sits on the site where the first White Castle restaurant was built in 1921. White Castle presented the bank with a commemorative landmark plaque that is a stainless steel etching of the first White Castle restaurant. “Visiting the site where the first White Castle restaurant once stood, now home to our friends at Sunflower Bank, was an invaluable opportunity of all generations of our family,” said Maryann Ingram Kelley, granddaughter of White Castle co-founder Billy Ingram. “We are honored to share the land with such an iconic and strong-valued company like White Castle,” said John Hanley, public relations officer for Sunflower Bank. More than 3,000 community members came to get their share of hot, fresh, steam-grilled-on-a-bed-of-onions goodness. 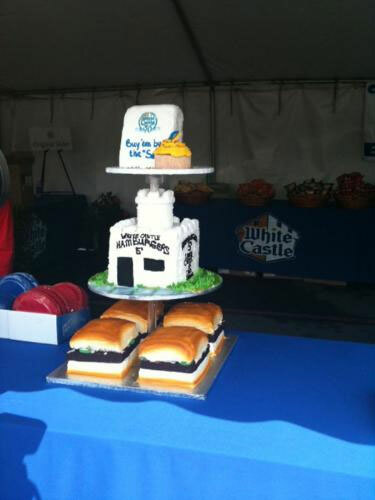 For the event, White Castle offered two Original Slider® hamburgers for just 90 cents. In addition to the food, attendees participated in family-friendly activities, ate birthday cake and received White Castle and Dillon-branded merchandise. White Castle is a family-owned business based in Columbus, Ohio that owns and operates more than 400 White Castle restaurants in 11 states. The company was founded in Wichita, Kansas in 1921 and is America’s first fast-food hamburger chain. All White Castle burgers are made from 100-percent USDA approved beef. This year, the company celebrates its 90th birthday with special events and promotions occurring throughout the year. For more information on White Castle, visit www.whitecastle.com. Founded in 1892 in Salina, Kansas, family-owned Sunflower Bank is a $1.7-billion community bank with more than 30 locations throughout Kansas, Colorado and Missouri. Sunflower Bank provides commercial and corporate services, personal solutions, wealth management and mortgage loans, dedicated to “bringing out the best in the lives we touch … creating possibility” – the mission statement of Sunflower Bank. Learn more at www.sunflowerbank.com.